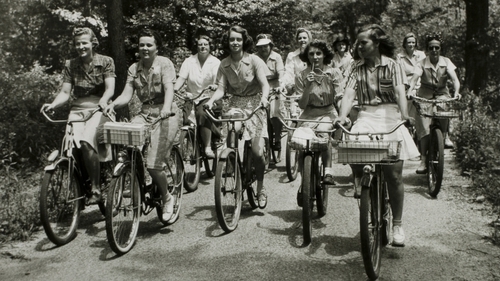 Bicycles are likely younger than you’d think. To pinpoint the invention of the bicycle requires us first to agree what precisely a bicycle is and does. Very basic two-wheeled contraptions, later called "dandy horses", appeared in the late 18th century but they lacked pedals and were propelled by the seated rider "running" along the ground. Ernest Michaux and Pierre Lallement’s "velocipede" of 1861 added pedals to the design, but the lack of an effective gear system meant that the bike was slow and laborious, necessitating its replacement by the "Penny-farthing" in 1870. The large front wheel offered a considerably better ratio of pedal turn to wheel turn, allowing for a smoother and faster ride, but this high, lopsided machine was difficult to mount (you needed a running start), difficult to control (one sat several feet in the air), and not a little dangerous. Handlebars? Yes, but you’d probably be surprised how long people rolled along on two wheels before someone worked out how to use those glorified armrests to steer. And brakes? Don’t be so naïve. The first bicycle to combine all the things we now think of as defining the bicycle was designed by John Kemp Starley in 1885 and advertised, tellingly, as the "safety bicycle". The Starley Rover combined a chain-driven rear wheel powered by a crank and pedal system mounted on the main frame, two wheels of equal size, brakes, a steerable front wheel, and comfortable leather seat, all in one sturdy but elegant package. What followed was a veritable cycling revolution as companies sprang up to fill the demand for these new machines. This competition in turn drove down prices such that, by the beginning of the 20th century, a bicycle was a genuinely affordable object for most lower-middle class families in Britain and Ireland. Though social historians have documented the considerable social changes that followed the wide-scale adoption of this technology – from its role in defining Victorian ideas of "leisure time" to its status as a symbol of the new, liberated woman – there has been surprisingly little said about the way that this revolutionary technology featured in and shaped the arts and culture of the period. Most of the great modernist writers and artists were born between 1880 and 1900. "Modernist" is a broad term, but includes avant-garde writers like James Joyce, Virginia Woolf and T.S. Eliot as well as prominent artists like Marcel Duchamp and Pablo Picasso. Their childhoods and adolescences were spent in the midst of the most dynamic period of cycling development and expansion (Joyce and Woolf were three when the Starley Rover was invented) and they duly responded in their works. For example, though best known for his "Fountain" (an upturned urinal), Duchamp’s first "ready made" was a bicycle wheel mounted upside down on a stool. In a similar vein, one of Pablo Picasso’s most famous sculptures made use of a bicycle saddle and seat to form a "Bull’s Head." To give a literary example, the works of Samuel Beckett overflow with references to bicycles, from an extended monologue in one of Beckett’s novels, Molloy – "Dear bicycle, I shall not call you bike, you were green like so many of your generation, I do not know why" – to the bicycles that (don’t) appear in his post-apocalyptic play, Endgame – "When there were still bicycles I wept to have one, I crawled at your feet." Flann O’Brien’s The Third Policeman takes place in a purgatorial dreamscape filled with policemen who focus almost entirely on bicycle-related crimes. So were the modernists cyclists? We can say without doubt that most if not all of the modernists rode a bicycle at some point. Some did so habitually, others regularly, all of them at least occasionally. T. S. Eliot cycled regularly for leisure and relaxation, including one notable trip with fellow modernist, Wyndham Lewis, that ended with Lewis suffering serious damage to his knee after his handlebars snapped, sending him tumbling. Though she preferred long walks, Virginia Woolf cycled recreationally as a young woman (on holidays in the Cotswolds) and would later do so for convenience to and from the train station near her home in Sussex. The question of whether Joyce cycled has significantly occupied at least one critic, though Joyce’s poor eyesight means he probably didn’t cycle seriously beyond his teen years. This doesn’t stop him filling his works with, often incidental, references to bicycles and bicycling. Similar stories can be told of almost all the writers and artists of the period. Then as now, the term "cyclist" meant something more than just getting on a bike. To be a cyclist suggests a level of enthusiasm that can be off-putting or attractive depending on your persuasion. Typically, the man reputed to be the first in Ireland to ride a bicycle, Dr Austin Meldon, almost immediately started a (presumably somewhat lonely) club. To be a cyclist at the turn of the century meant being a member of the "brethren" or "freemasonry of the wheel." Cyclists wear special clothes and use a special language; they memorise gear ratios and discuss the best way to avoid "bonking." More recently, they go on spring training "holidays" in Mallorca, obsess over power outputs, VO2 max, and the efficiency of their aero tuck positions. As French author Paul Fournel eloquently notes in Need for the Bike, "when you get on your first bike you enter a language you’ll spend the rest of your life learning." One is or isn’t a cyclist precisely because, for the cyclist, cycling is a state of being not a state of doing. Of the modernists, perhaps only Samuel Beckett, a keen athlete, ever met and acknowledged these conditions. All of them, however, experienced the pleasures of cycling, observed its place within a complex modern system of transport, production, and recreation, and, most importantly, made this object part of the way they read and wrote the world around them. The "clubbishness" of cycling may have contributed to a general distrust of it among the modernists, some of whom seemed to associate it with a particularly bourgeois, prosaic banality. American poet Amy Lowell incorporated this into her growing dissatisfaction with London bookshops: "a whole counter....is covered with monographs which instruct you minutely as to how to grow fruit-trees, catch salmon, handle golf clubs, or bicycle through the home counties." In discussing contemporary poetry, Virginia Woolf feigns "instant confusion" when opening a representative volume: "here are the common objects of daily prose—the bicycle and the omnibus." This statement is more remarkable because the poem (Auden’s "Which of You Waking Early") makes no mention of a bicycle. Elsewhere, she makes an apology for the "meanness" of E.M. Forster’s early novels, claiming that "though Mr Forster may be sensitive to the bicycle and the duster, he is also the most persistent devotee of the soul. Beneath bicycles and dusters....there always lies for him...a burning core." Yet while the association of the bicycle with dull, bourgeois values clearly made it a target for modernist disdain (the attack, essentially, is on bicyclists, not on bicycles), the bicycle itself offered an escape from the sameness and anonymity of modern existence. Luigi Bartolini captures some of this in his novel of a man trying to recover his bicycle, Bicycle Thieves. The protagonist laments that the thieves will have "dismantled it, piece by piece, bolt by bolt, screw by screw." And "yet," he thinks, "I should be able to recognize even a fragment that belonged to my bicycle." The concern is a particularly modernist one: what happens when a previously whole thing (like the self) begins to break up into interchangeable pieces (like the self in modern society)? But here, the bicycle offers a defiant source of optimism, a sense that the individual may survive the disintegrating forces of modernity. The choice of a bicycle is all the more remarkable because the bicycle is itself the example of modern mass production par excellence. It is a product (identical to thousands of others) compounded of a series of identical, anonymous, replaceable parts. Yet, we see the same optimism in D.H. Lawrence’s Sons and Lovers, in which the eponymous son and lover (they are the same) rides regularly to visit the house of his chaste "lover." His bicycle "seems to go with him as if it were a live thing" that "glitter[s] as he walk[s]." It exhibits an aura, a distinct, individual presence, that should be impossible for a mass-produced machine. In critiquing technological modernity, Walter Benjamin describes the way that works of art must necessarily lose their "aura" in an age where things can be reproduced almost infinitely. The aura is essentially a sense of awe we feel when confronted by the sense of uniqueness and individuality of a beautiful or significant object. But if the object I enjoy is identical to a million others, then what sets it apart from those others? But in the glitter of Sons and Lovers, the minute recognition of Bicycle Thieves, and in Beckett’s sweet-talking of his "dear bicycle" in Molloy, we can see the way that certain modernists saw this mass-produced object as resisting, perhaps even curing, this very process of fragmentation and dilution. In these works, the bicycle is seen to radiate a special power. For the modernists, the point, really, is that the fate of the individual is tied to the fate of the individual object in capitalist modernity. This takes a slightly different turn in Flann O’Brien’s The Third Policeman, which contains the "Atomic Theory," in which a police Sergeant warns against riding a bike over rough terrain. The constant bashing together of rider and bike leads, he says, to an intermingling of the atoms such that one Michael Gillaney is already "nearly half a bicycle." "If it wasn’t that his bicycle was stolen every Monday he would be sure to be more than halfway [to being a bicycle] now." Though a man turning into a bicycle might seem a horrifying metamorphosis, there is little genuine angst about it in the novel. It seems instead that this transformation might even represent a particularly angstless kind of communion with modern objects. The question for us as readers is whether this transformation represents an uncanny, but unruffled acceptance of modern objecthood or a critique of a modernity that seeks to erase the boundaries between human and machine. For all these writers, at any rate, the bicycle represented more than just another way to get around. It offered a softer, quieter, more amusing image of capitalist, technological modernity and a way for these authors to experiment, ask big questions, and to think outside of the wrought, anxious, pessimism demanded by more apparently "serious" objects.